Friday, August 17: The Weekly Photo Challenge for this week is Merge. The world is made up of many things. There is a saying that opposites attract, and this is true for relationships and other things. What about photography? Many surprises can come out of merging two different entities into one. Sometimes this fusion of the elements is what we call art. For instance, try placing an object where it does not belong. Or, juxtapose two different objects. The statements they make together may be contradictory, but remember: break the rules and experiment. Let’s see what you can MERGE in a photo! 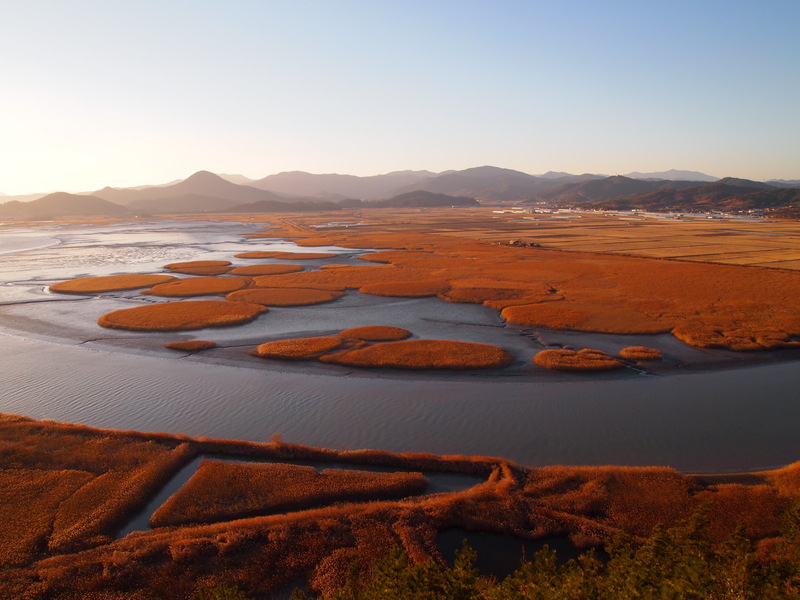 Here’s a photo of the merging of water and land in the marshland of Suncheon Bay Ecological Park in South Korea. The bay is a coastal wetland with a large tidal flat, reed beds and salt marshes nestled between mountains and ribboned with rivers. To read about my trip to Suncheon Bay with my son Alex, see: “handsome boy” visits korea: motherhood revisited. stunning landscape and wonderful capture! Lots of textures and shapes. You captured the topic. Thank you Lynne! It took me forever to find one that fit the challenge! It looks like a fascinating place. Well done. I love not just the colour, but the geometric, alternations. Gorgeous. Thank you so much Good Villager! I’m glad you like it! Probably the most picturesque marshland I’ve ever seen. Kudos! Thank you so much irisoniris! Amazing colour and patterns, as though they’ve been drawn. Thank you Wanderlust! From that viewpoint they really do look like a painting! I’d love to see some of your photos – sadly I’ve never been to Korea, but I understand it’s a stunning country, and you’ve got a good eye Cat. it’s interesting about cutting down on the words – Kate Shrewsbury says 600 is the max people seem to have the time and patience for these days – especially in our blogging world where we want to follow so many different threads of interest. I’ve sure cut down (most of the time!). Kate Shrewsbury, whoever she is (! ), is certainly right. I find that I myself don’t have time to read long wordy posts. I think I will keep my format to lots of big pictures and little text. Maybe I will revisit my Korea blog and start posting a few pictures at a time. If I have time that is! Thanks for the compliment about my good eye. I think it gets better with time and practice, but many of my earlier pictures are just terrible!! I know. And I keep trying! This should be the cover of a magazine! What a lovely ecological park. Thank you Myra! It was one of my favorite places in Korea! What a captivating place. It makes a superb photo Cath. Love this photo, and your thoughts about the challenge theme, wonderful choise! Beautiful landscape and well taken! Thank you so much GinTonHic! Here is my Weekly Challenge. Thank you so much, eof737! Super great photo,you capured the challenge. I know Marco! It is pretty unreal. I don’t think I’ve ever seen a marshland that looks like this! I love all the circular patterns. Luckily there was a mountain where I could hike up and get that view! This is absolutely stunning! One of your best in my opinion! Beautiful. A spectacular gift of nature!